Commander of American Legion Post 422 John Sabatino plays “Taps” at the Veterans Day ceremony at the John Philip Sousa Memorial Band Shell. 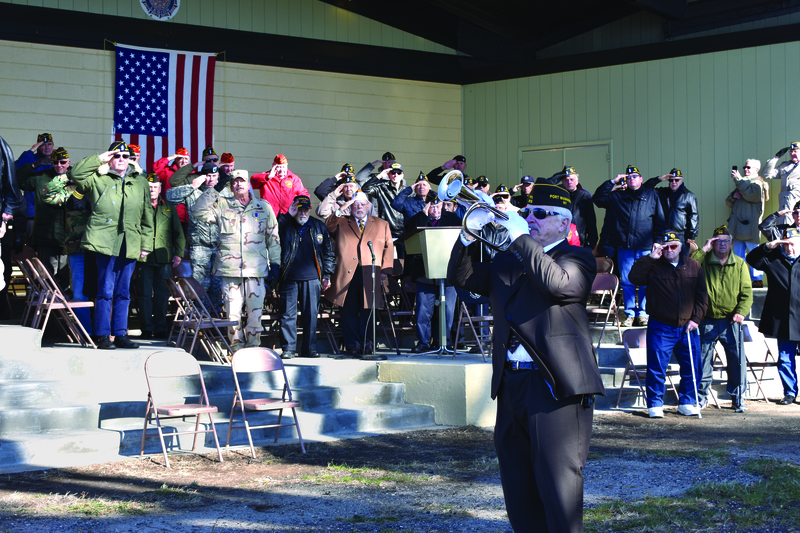 Port Washington veterans gathered on stage at the John Philip Sousa Memorial Band Shell in Sunset Park on Nov. 11, to celebrate Veterans Day and the 100th anniversary of the signing of the Armistice to end World War I. Commander of Henderson-Marino Veterans of Foreign Wars (VFW) Post 1819 John Baptisto Fiore started off the ceremony by welcoming the community and reciting “They Did Their Share” by Joanna Fuchs. 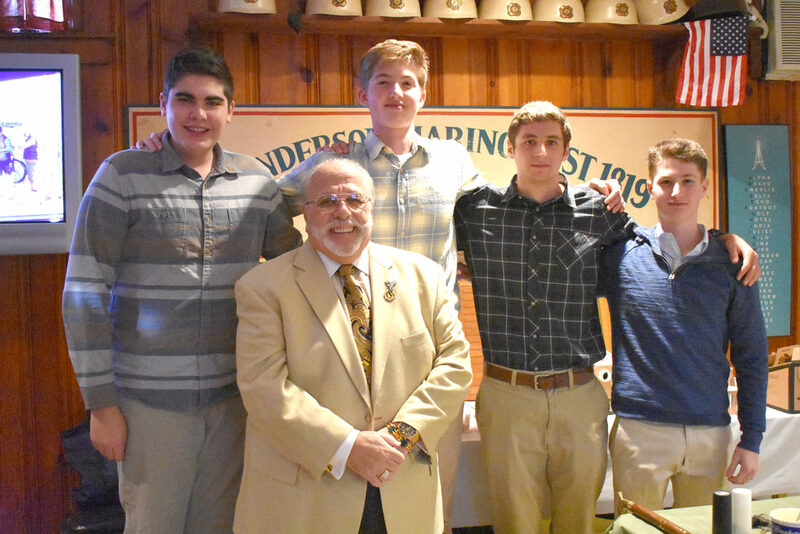 Commander of the Henderson-Marino Veterans of Foreign Wars (VFW) Post 1819 John Baptisto Fiore with members of the American Heroes Club at the VFW on Mohegan Avenue prior to the ceremony at 11 a.m.
Baptisto Fiore thanked the veterans from the local groups—including Port Washington American Legion Post 509, Henderson-Marino VFW Post 1819 and Port Washington Detachment 614, Marine Corps League—along with a group of Schreiber High School students who are part of the American Heroes Club. He recounted how the students stood side by side with him in the pouring rain to place American flags on Memorial Day on the gravestones of veterans who died. Previous VFW Post 1819 commander John Chalker called upon each veteran to stand when he called out the war they fought in and then recited the poem “In Flanders Fields” written by Lieutenant Colonel John McCrae. Member of the American Legion Post 509 James Ansel gave the Veterans Day Address, thanking veterans and their families. Ansel recited a quote from Emily Dickinson that stated, “Hope is a thing without feathers that perches in the soul and sings a tune without words and never stops at all,” and said that everyone is filled with hope, but they must be realistic that as long as conflict exists, so must veterans.